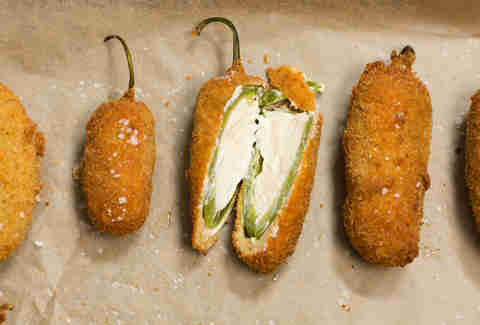 Jalapeño poppers are one of the most customizable, versatile bar foods. 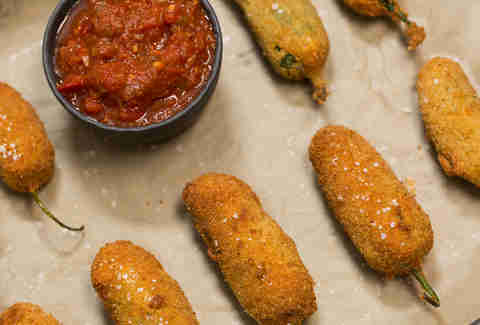 You can stuff them with nearly any cheese imaginable (cream! Jack! GOAT? 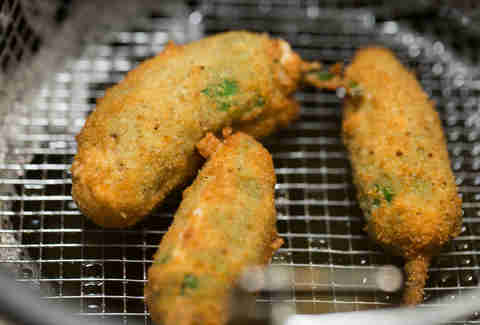 ), and they always taste amazing, and make you look cosmopolitan and handsome. Add to that the fact that they’re cheap and easy to make, and you should basically serve them at every party ever. Our recipe gives you the basic foundation from which to experiment, but make sure -- if you want a thick, crispy crust -- that you triple-dip the batter. People will hear the crunch from miles away, and you will become a handsome, cosmopolitan legend. Rinse and dry 2 pounds of jalapeños. Put on disposable gloves and cut a “T”-shaped incision along one side so you can open them and remove seeds and white inner ribs. The top of the “T” goes across the top of the jalapeño, right underneath the stem. The length of the “T” ends just before the tip. Season 1 pound of cream cheese with whatever you want. This is where you can get creative. 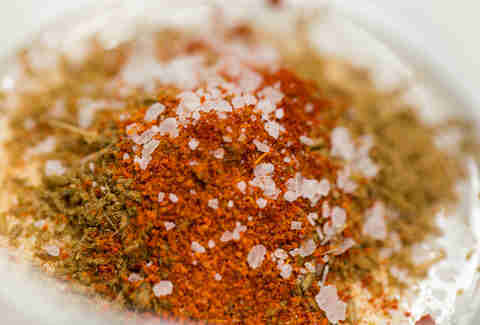 We kept ours simple with lime juice, garlic powder, onion powder, salt, and cumin. 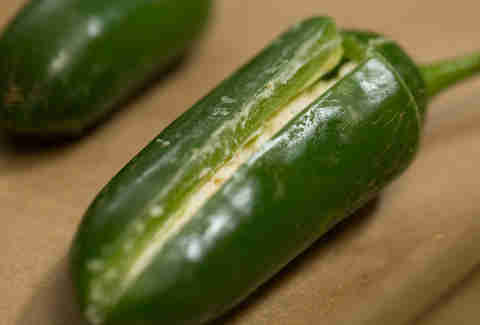 Using a butter knife, pack cream cheese into each jalapeño, filling it completely and closing it back up. Heat 2 inches of oil to 350°F in a deep fryer or large pot fitted with an oil thermometer. Put 1 cup milk, 1 cup flour, 6 whisked eggs, and 3 cups breadcrumbs in 4 separate bowls. 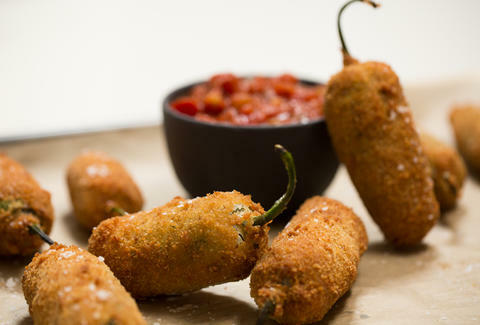 Working with one jalapeño at a time, dip in milk, dredge in flour, dip in eggs, dredge in breadcrumbs, dip again in eggs, and dredge in breadcrumbs once more, making sure the jalapeño is well coated. Repeat with the rest. Add poppers to the hot oil and fry, turning occasionally, until golden brown, about 5 minutes. Transfer to a parchment-lined baking sheet and season with salt. 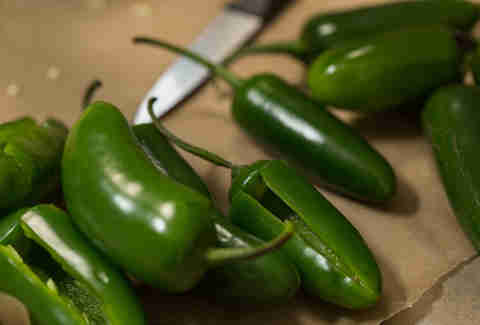 Serve warm with salsa.